Raw sewage is flowing into our streams and rivers and eventually to the Chesapeake Bay. Where is this sewage coming from? A key source is an antiquated storm water and sewage system for Baltimore City. In 2002 the Maryland Department of the Environment (MDE) sued Baltimore City and an original consent degree to correct overflow of raw sewage was filed. There was a 2016 deadline for Baltimore City to correct existing problems. Although some progress was made, the deadline passed and there were still sever deficiencies. A modified decree was approved October 6, 2017 that extended the time allowed to correct problems. It is broken down in two Phases. First phase must be completed by 2021 and second phase by 2030. During the first phase 83% of the sanitary sewage overflows are to be corrected. Baltimore City takes in over 250 million gallons of water a day and sometimes the system can not handle the load. The happens especially during wet conditions. To make matters worse, built into the system are intentional overflow structures. They are called Sanitary Sewage Overflow (SSO)Structures. They are “vents” for the system. When the system was developed in the early 1900’s it was considered state of the art. However, in today’s standards it is substandard way of handling excessive amounts of storm and sewage water. Many of these SSO structures have been eliminated. However, there are still 12 currently identified in the latest report1 from the city. Here are some staggering numbers. In the 4th quarter of 2018 over 9.7 million gallons of water containing sewage entered the watershed from sanitary sewer overflows. However, the numbers from the SSO structures are alarming. Over 56 Million gallons of water containing raw sewage entered the watershed! This typically occurs during heavy rains. Discharged water can contain harmful pathogens that can cause illness. When humans come in contact with contaminated water they should thoroughly wash the area with soap and water. When purchasing shellfish, make sure they are coming from an approved source. Pathogens like Norovirus or Hepatitis A can be in shellfish we consume. You can contract these viruses regardless if the shellfish is cooked. Always ask your seafood retailer to see the shell stock tags. They show the area the shellfish were taken from. If they do not have a shell stock tag – DO NOT PURCHASE. It is required by health department law that the tag be with the product until it is sold. Chemical toxins are a concern as well. During heavy rains ground water that contains pesticides and other chemicals enters the storm water system then that water could be released from SSO structures at streams and rivers. Pharmaceuticals that are flushed in toilets have been found in water from SSO. 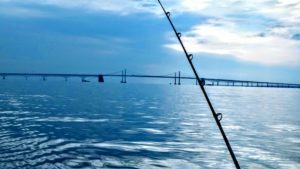 Sewage and run off should concern everyone that enjoys the bay. Whether it is for swimming, recreational or commercial fishing, or just enjoying the wonderful views and wildlife that it gives us. Help support a healthy system by not flushing anything that could clog the pipes like feminine products or “flushable” wipes. Do not put anything down as drain that could harm the system, including fats oils and grease (FOG), pharmaceuticals, old paint, chemicals or anything that you would not want in the bay. This entry was posted in Uncategorized and tagged baltimore city consent decree, clean water act, fishing, sewage, shell stock tag by admin. Bookmark the permalink.